We never need a reason to throw a tea party, but if you are looking for an excuse, next week offers two prime occasions: Mother’s Day on Sunday and the Royal Wedding the following Saturday. 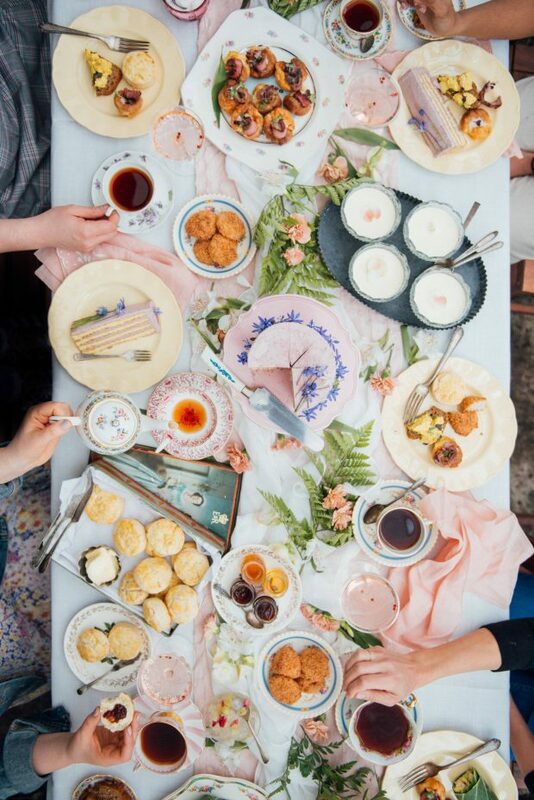 In a May Day celebration, and in anticipation of the upcoming Royal nuptials, a few friends and I collaborated on a splendid outdoor tea party last week. Local food photographer Alison was there to capture it all on camera, which meant I could sit down, pour tea and serve cake. 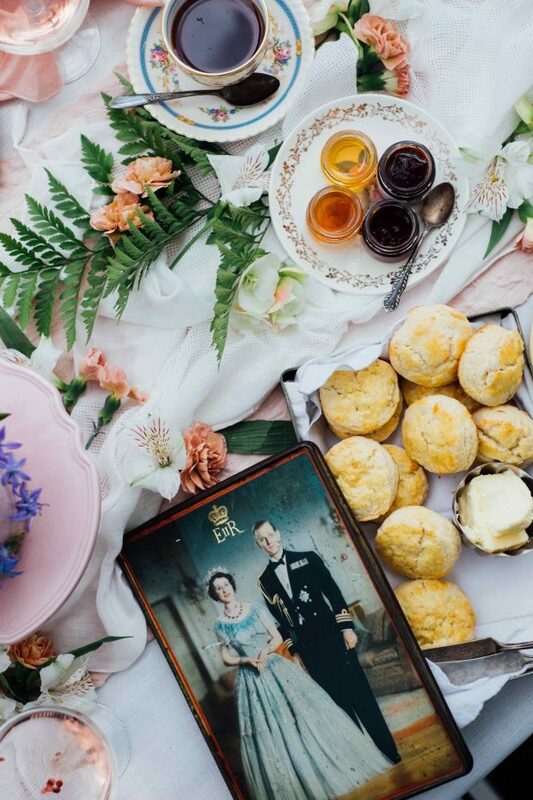 If that sounds ideal, it rather was; and I hope these images inspire you to invite a troop of tea drinkers over and bake a batch of vanilla cream scones for the party. May is a month of celebrations – we have a Mother’s Day, a long weekend, and our wedding anniversary (coincidentally on the same day as Harry and Meghan’s wedding). 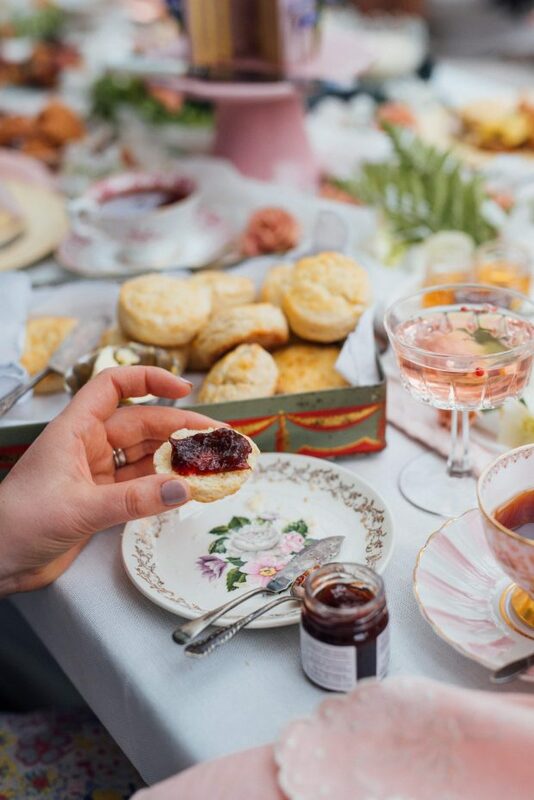 There’s usually a wedding or baby shower to attend – or host – in May and afternoon tea is such a fun way to mark these special occasions. 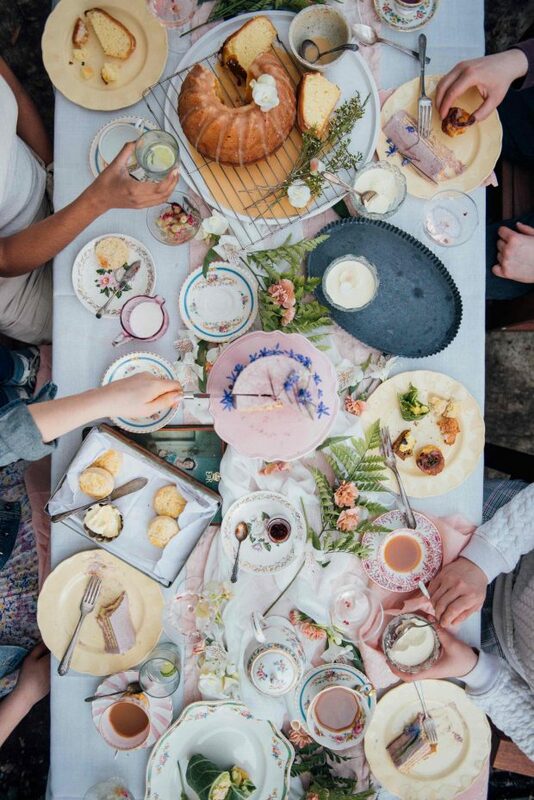 My friends and I collaborated on the spread above (decorations and clean-up, too) which meant no one was saddled with preparations, and we could all sit down together and relax. UK-born Kerrie (I’ve talked about her before!) made sure our menu was tip-top with mini Yorkshire pudding, stuffed with roast beef and horseradish, as well as the most amazing Coronation chicken sandwiches. Margherita, our Italian friend, sweetened up the tea with her delicate panna cotta and flawless coconut macaroons. 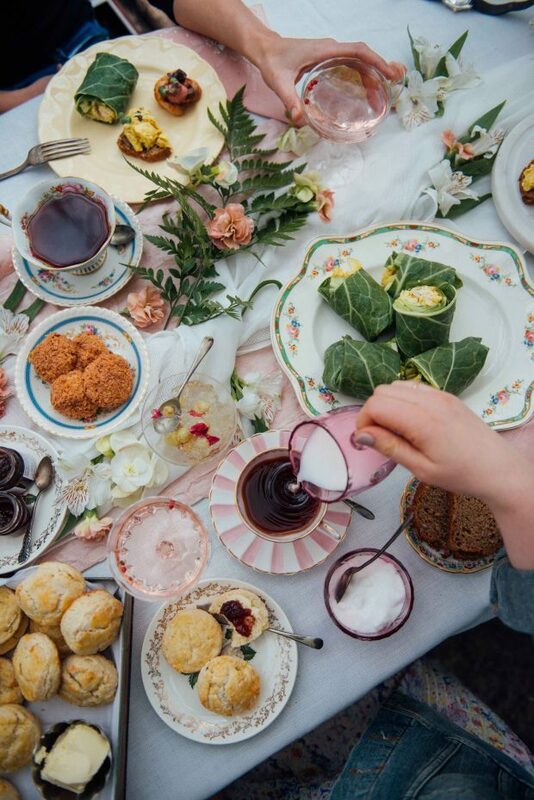 It’s no secret that I adore setting a pretty tea table and making tiny finger sandwiches. Remember the time I threw an afternoon tea party for my sister’s baby shower? It was such a fun way to celebrate my new nephew and a perfect excuse to bake all sorts of treats. 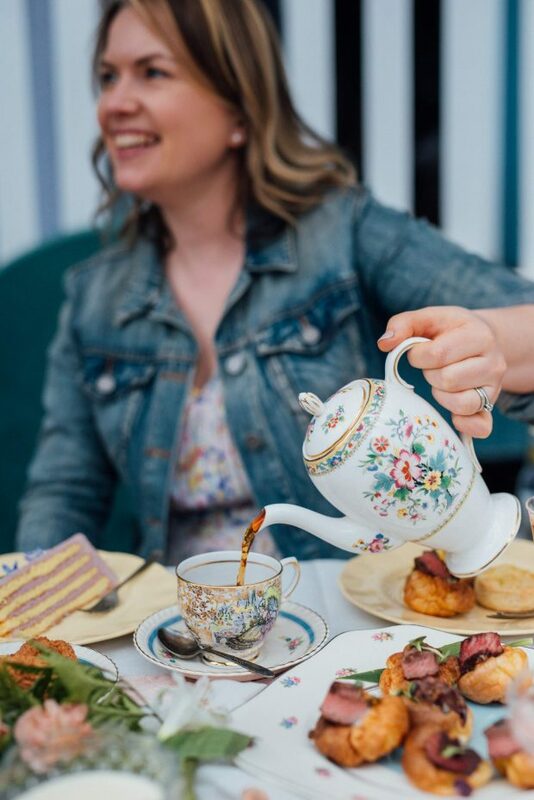 And on our trip to London last May we made time for afternoon tea at The Orangery in The Pavilion, surrounded by beautiful formal gardens in the grounds of Kensington Palace. Dreamy and unforgettable. Any chance I get to revisit the tea party, I’m there with my pinky up. I’ve emphasized over and over that you don’t have to own a matching set of dishes or procure a tea set to lay a pretty table. Mismatched cups and saucers are adorable (and trendy right now, to tell the truth). I would recommend laying a neutral background, such as a cream or off-white tablecloth, then adorn it with a few fresh flowers or natural greenery. After that, break out the floral dishes, a tea pot and stemware. Find your prettiest napkins and open a few jars of jam. I popped into my local antique shop, just to look, of course, and found this vintage biscuit tin with Queen Elizabeth and Prince Philip on the front. Talk about perfect for a Royal tea! It added a regal touch to our humble event and made us feel a little closer to the Palace. 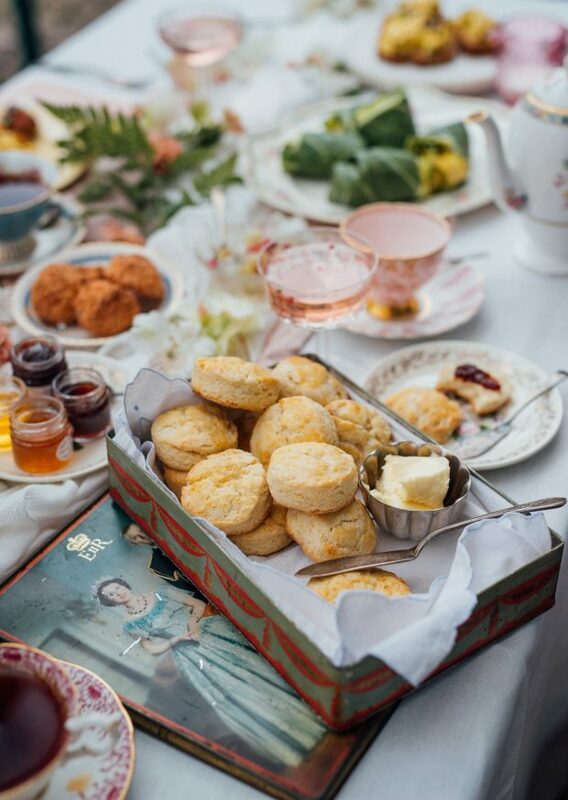 Vintage tins, cake stands, your grandmother’s antique platters…any and all of these add an effortless elegance to the tea table. But we need to talk about these scones! So when I was planning my afternoon tea baby shower I went on a quest to find ‘the perfect scone’. I gathered recipes from such greats as Nigella Lawson and Dorie Greenspan and magazines like Delicious and Jamie. In the end, the recipe came to me in an issue of Saveur. Saveur featured an interview with London baker Claire Ptak and ran her recipe for Sweet Cream Scones, an American-inspired scone on English soil. I tried out the recipe and was smitten. This was the one I had been looking for all along. Fluffy and flakey, moist enough, and not too sweet. Best of all, light as a feather. If the name Claire Ptak sounds familiar, it is probably because she has recently been in the spotlight (understatement) surrounding the Royal wedding. Apparently Meghan Markle called up Claire at her Hackney bakery, Violet, and asked her to make their wedding cake. Well now! See how we are coming full circle for this tea party? I’ve made these scones over and over, with slight variations here and there. Chopped dark chocolate is the kids favourite add-in; currants or fat raisins are traditional. But my absolute favourite version is with both vanilla bean paste and a splash of pure vanilla extract. 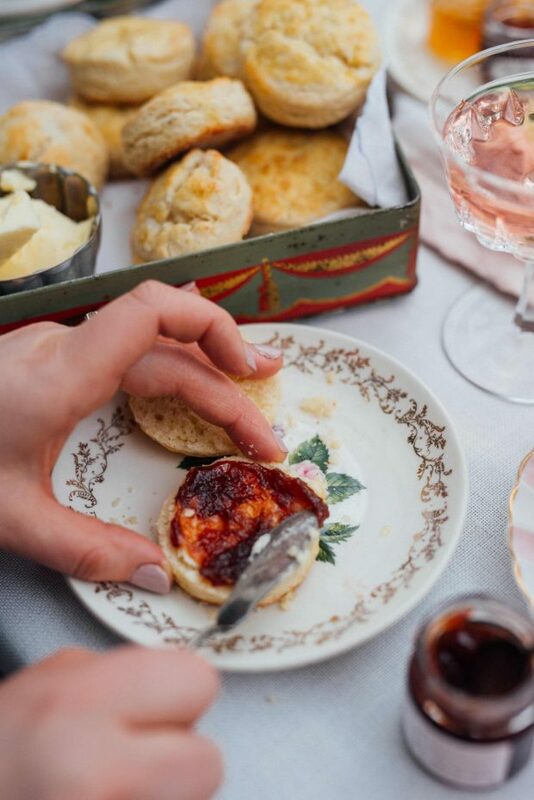 It perfumes the scones – and the kitchen too – and makes for an extraordinary scone pairing with jam. This is the recipe I am sharing today, because everyone should have a classic cream scone in their baking repertoire. These scones freeze very well, so go ahed and prep a batch in advance for Mother’s Day. You can thank me later. The perfect scone, light and buttery ,and ideal for afternoon tea. Slightly adapted from Claire Ptak via Saveur Magazine. In a large bowl, whisk the flour with the sugar, baking powder, and salt. On the large side of a box grater, grate the cold butter into the flour. Then, using your fingertips, quickly rub the butter into the flour until it forms pea-size crumbles. Add the vanilla and the vanilla paste, if using, to the cream and pour it over the flour. Stir with a fork until the dough just comes together. Scrape the dough onto a lightly floured work surface and, using lightly floured hands, form it into a thick, flat block. Let rest for 5 minutes. Fold the dough in half (like closing a book), press into a flat block once again and then let rest for 5 more minutes. Using a rolling pin, flatten the dough block until it's 1-inch thick. Using a 1 ⅞-inch-round cutter, cut out rounds of dough and transfer to parchment paper-lined baking sheets, spaced 2 inches apart. Press the scraps of dough together and re-cut more scones. Place the baking sheets in the freezer and freeze the scones for 20 minutes. Heat the oven to 400°F. Remove the scones from the freezer and, using a pastry brush, lightly brush the top of each scone with some of the beaten egg. Bake the scones, rotating halfway through, until risen and golden brown, about 20 minutes. Transfer the baking sheets to a rack and let the scones cool slightly. Serve warm with jam and butter. Pssst! Look for that cake recipe coming soon…. All images courtesy of Alison Slattery of Two Food Photographers. Thanks, Alison! Perfect timing! I was just thinking last night that I need a good recipe for scones. These will be perfect to enjoy while watching the Royal wedding! If you have any idea on the main dishes, please inspire. Happy Birthday, YY Wong! That’s going to be a special day. So for main dish…you could do an asparagus quiche with a green salad. Yum!!! Definitely making them, Aimee! Thank you for the inspiration! Question though: if we make them ahead for Mother’s Day, do we freeze them unbaked and, the day of the event, bake them for the regular length of time? Happy early Mother’s Day, Cecelia! So you could do both. To keep it simple, why not bake them all the way (enjoy a few) and then freeze them for Mother’s Day. Just have Jordan reheat them in a 300F oven for 10 minutes or until they are warm through. 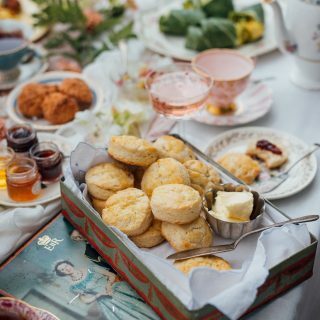 This recipe perfectly captures the feeling I had as a little girl when my grandma used to throw tea parties and have scones just like this! That is the sweetest, Marie. I kinda can’t wait to do this with a pack of grandkids! Holy moly Aimée! Now *THAT’S* what I call a tea party! 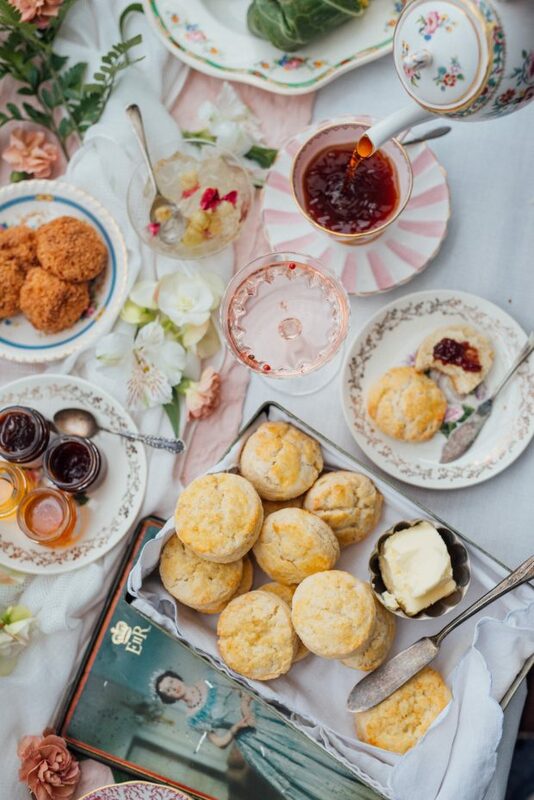 Honestly, you had me at Vanilla Cream scones (I’m a sucker for scones…) but I was not prepared such a gorgeous spread! They look amazing! Can’t wait to make these for all my friends on christmas!